There's a big battle brewing in the Jefferson County, Colorado, school system. The manufactured controversy over a proposed curriculum review is generating national headlines. But the fight is not about what misguided students and biased reporters say it's about. "Censorship" is a red herring. The real issue is union control. Here's the deal: Public school teachers in this Denver-area district walked out of their classrooms this week to protest the implementation of performance-based pay. The JeffCo school board approved the new compensation system last week, which rewards the most highly effective teachers with 4.2 percent raises, effective teachers with 2.4 raises and inferior teachers with nothing. Only 2 percent of teachers received no pay raises. One fact the grievance-mongering teachers conveniently left out of their politicized pep talks to student sympathizers: The board gave bonuses to 450 teachers who would have otherwise received no raises under the union's arbitrary step scale. The old system didn't take performance into any consideration at all. Despite the hefty rewards for teacher competence and excellence, disgruntled union leaders called for a strike last Friday (or as they prefer to whitewash it, a "sickout"). The Big Labor avengers succeeded in shutting down two schools -- and enlisting students to protest with them. But the optics of robbing kids of valuable educational time to protest an $18.2 million salary compensation package did not play well with taxpayers. At the same board meeting where the new pay system was approved, elected school board members heard a proposal to form a curriculum review committee. Under the state constitution, elected local school boards are responsible for instructional and curriculum matters. It's their duty. The proposal called for the creation of a new, nine-member panel "to review curricular choices for conformity to JeffCo academic standards, accuracy and omissions, and to inform the board of any objectionable materials." The panel's first review items would be the elementary health curriculum and the A.P. U.S. History (APUSH) curriculum, which has undergone a radical revamp over the past few years. The chief architect of the APUSH revisions is David Coleman, a progressive ideologue who is also one of the prime movers and shakers behind the Common Core standards scheme. Objections to the shoddy, intrusive, costly, top-down, backroom-designed Common Core agenda cross party lines. Rank-and-file teachers across the country have joined a diverse anti-Common Core coalition of parents, administrators, scholars, grassroots activists, privacy advocates and anti-cronyism watchdogs. The JeffCo school board takes its deliberative role seriously. The proposal is the opposite of censorship. The debate over history standards is part of a wider battle between left-leaning militant teachers' unions, who explicitly see their primary role as Saul Alinsky-trained political agitators, and those who want to restore academic excellence, rigor and ideological balance in the schools. 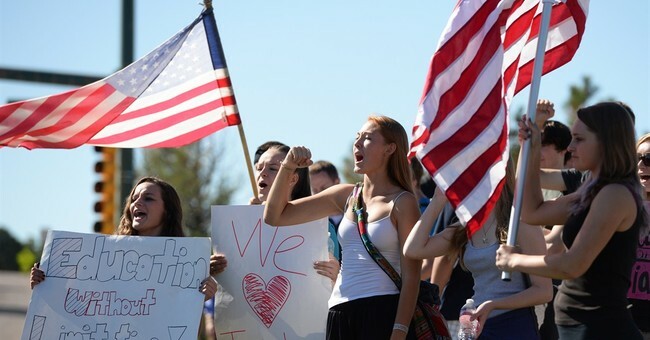 While every liberal "-ism" has been incorporated into the school day -- from environmentalism and collectivism to social justice activism to mandatory volunteerism, feminism and transgenderism -- JeffCo school board members are now being mocked for simply proposing that citizenship, individualism and patriotism have a fundamental place at the schoolteacher's table. Somehow, this perfectly reasonable proposal morphed into "JeffCo wants to remove slavery from the history curriculum!" Next thing you know, students were walking out of class two days in a row this week with "We (Heart) Our Teachers" signs. And the liberal Denver Post was running propaganda stories on Twitter mockery of the school board. "It upsets me greatly to see children being used as pawns and missing educational time," school board president Ken Witt told me. And "we're not just going to rubber-stamp" the top-down APUSH changes, he says. But the bigger picture, Witt points out, is that the district's "union contract expires in August. It will be entirely redrafted." The agitators' ultimate goal is "to create turmoil and discredit board before those negotiations." And they are trying to do so by any means necessary -- including misleading kids, spreading falsehoods in the classroom and instigating walkouts through student-managed organizing websites. "This is not to say that the concern of NEA and its affiliates with closing achievement gaps, reducing dropout rates, improving teacher quality and the like are unimportant or inappropriate. To the contrary -- these are the goals that guide the work we do. But they need not and must not be achieved at the expense of due process, employee rights and collective bargaining. That simply is too high a price to pay. Listen up, class. For public employee union leaders, it's not really about the children or academic excellence or curricular freedom. It's about their own political self-preservation. Always.